The Prime Directive is under threat, Picard hates being treated like a god, and surprisingly its possible that superstition or disordered thinking has some benefit for primitive cultures. The Enterprise goes to help a covert 3-person anthropologist team. The early exposition tells us that they're observing a group of Bronze Age, Vulcan-like people from a holo-duck blind. As the ship approaches the anthropologists report that their power is failing, an explosion injures the team, breaks their holo-camoflage and one of them falls onto the rocks outside. The Enterprise speeds to the rescue. Geordi fixes the equipment as Crusher examines the injured. A native father and daughter see the revealed duck blind and investigate. The daughter (Oji) is told to stay back as her father (Liko) climbs up the cliff and peeks through the window. Data sees him, then Liko gets an electric shock from the faulty equipment and falls down the hill. Crusher goes after him and finding him unconscious she has him beamed to sickbay. From her hiding place Oji sees her father and Crusher beam away. Crusher treats Liko and two of the anthropologists, the third is missing on the planet. Picard is angry that Liko was brought aboard and tells Crusher to wipe his memory and return him. Liko sees Picard and hears him asking about the third anthropologist (Palmer). After his return Liko tells everyone about 'the Picard' a god-like being that brought him back to life. Troi and Riker are sent to the village in disguise to find Palmer and assess the situation. They report on the cultural contamination and try to convince everyone that Liko dreamed the whole thing. The villagers are skeptical, until they find Palmer unconscious in a cave. They ask the only old person in the village about old stories and Liko takes it upon himself to decode what the Picard wants. He thinks Palmer is a disobedient servant and gets the villagers to tie him up. Troi creates a diversion allowing Riker to get away with Palmer, he's pursued and has to hide before they can be beamed up. Troi is held by the villagers, who are unsure what to do with her. Riker tells Picard about the situation and says the leader (Nuria) is well-respected. She's their best bet for rescuing Troi and repairing the damage. Nuria is beamed aboard and met by Picard, who she initially tries to worship. He stops her and tries to explain that they are simply very advanced mortals. She doesn't get the idea at first and asks Picard to return the dead, so he takes her to sickbay as the female anthropologist dies of her injuries. This convinces Nuria of Picard's mortality. 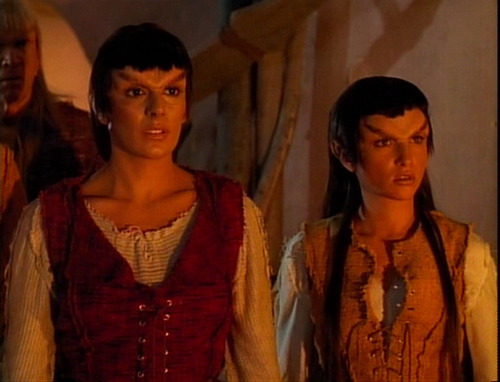 They return to the village where Liko is about to execute Troi in the name of the Picard. Nuria tries to convince him, but he won't listen. Picard has to appear in a pseudo-deus-ex-machina and tells him he isn't a god. Liko's new-found faith is confused and he ends up aiming a bow at Picard, who invites him to shoot if it will convince him he's mortal. Picard gets shot in the shoulder with an arrow and Liko realises he's done a bad thing. The ubiquitous Vasquez Rocks appear as the planet of Mintaka III. 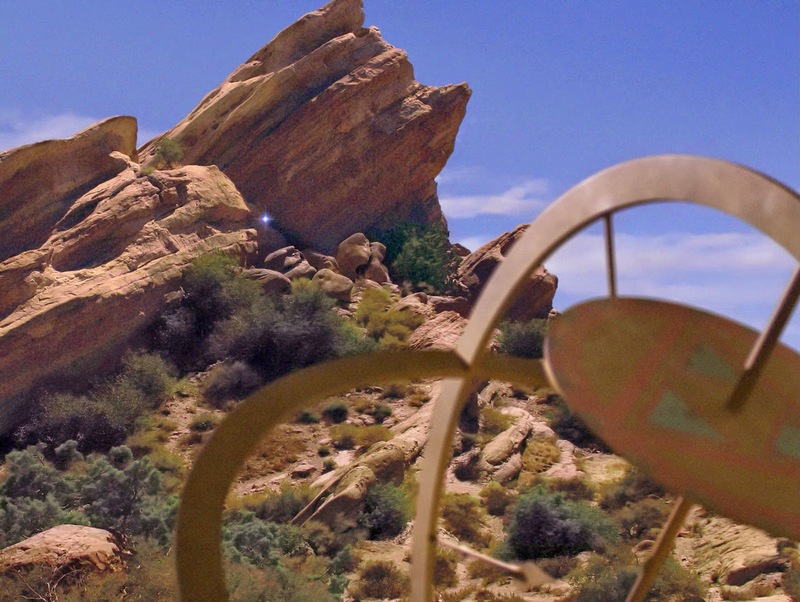 A veteran of The Original Series, the Vasquez Rocks were also a major part of teen sci-fi series Roswell and recently appeared as themselves in an episode of The Big Bang Theory. Liko decides the Captain is a god because The Picard is the first human he sees and he's obviously in command. 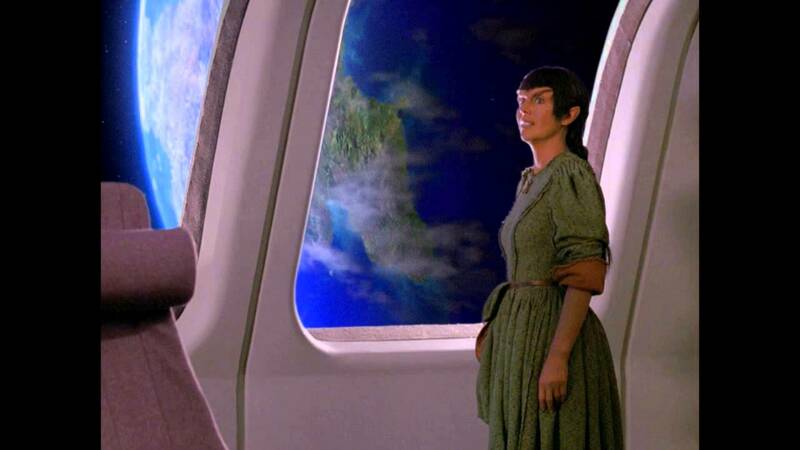 It's never explained how Liko is able to understand Picard, or how Riker and Troi can communicate with the villagers. Perhaps the Enterprise has a universal translator like the TARDIS? I'm sure no one put a babelfish in Liko's ear. Picard tries to fix the cultural contamination as best he can, even though it becomes a farce in which any attempt to solve the problem makes things worse. The lead anthropologist tells Picard that rescuing Palmer should be priority, especially as cultural contamination has already happened and can't be undone. It's also suggested that a quick-fix would be Picard giving a few orders/commandments. Picard is entirely unwilling to play god or in any way promote the false belief, allowing it to become a religion. In fact his answer to the problem could arguably be breaking the Prime Directive more, since he brings a primitive onto the starship. Picard and Nuria's conversation gives Picard a chance to talk his way out of the problem, which is his favoured solution. Crusher was the one that Oji saw beam her father away, and Crusher was the one who healed Liko, so she should really be the one they're worshipping as a god. Just saying. 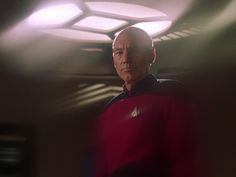 Pulaski is mentioned when Picard orders Crusher to wipe Liko's memory. Crusher points out that she hasn't done it and will have to refer to Pulaski's notes from when she did it. She also points out that it might not work on this species, and she's right. The proto-Vulcans seem to be roughly matriarchal, so when they're on the planet Troi walks ahead of Riker, it signals that if anyone wants his services they must bargain with her. She introduces them to the villagers and tries to convince everyone that Liko and Oji were dreaming, but the discovery of Palmer scuppers that. Troi provides a diversion so Riker can rescue Palmer and remains calm while she is held captive and villagers try to decide what to do with her. She know they don't want to hurt her, but they are also scared by the sudden shift towards the supernatural. She also points out that the problem with believing in a supernatural being is that it's hard to know what he wants. Even when Liko is pointing a bow at her Troi doesn't flinch. It gets so broken! And not even to save a little girl in mortal danger like in Pen Pals. "It is our highest law that we shall not interfere with other cultures." Considering it's the highest law of Star Fleet they don't seem to mind how close they come to breaking it just by having the anthropologists on the planet. I mean how did they install that facility without the locals noticing? It would've taken a fair bit of drilling. Unless holo-projectors block out noise too? Sending Riker and Troi in disguise is a good compromise and doesn't directly break the Prime Directive, but when they beam Nuria up that seems like a very definite and conscious smashing of the rules. I suppose once it's already been definitively broken, Picard reckons its better to repair the damage as best they can rather than allowing a cult to form in his name. Besides the revelation that interplanetary travel is possible might give these people the kick up the arse they seem to need. The primitive people are a lot like Vulcans* and have ordered minds. They abandoned superstition millennia ago and have not believed in the supernatural in all that time. Oji has recently been made the appointed record keeper and must measure the sun at its zenith, a duty she takes seriously. It's clear that they have a something like a scientific method when interacting with their environment. In her talk with Picard Nuria mentions that they've found bones in caves and realised that their ancestors must have lived in caves before they had huts. However, considering all this, it seems like maybe they should've advanced more. Assuming the modern idea that science = progress they don't seem that impressive, I'm not even sure if they have agriculture, domesticated animals or writing. It seems like maybe some kind of supernatural belief is actually useful, which I am sure is not the intended message of the episode since the idea of them developing religion is presented as a terrible thing and huge backward step. ** Of course it could just be that their ordered minds mean that these proto-Vulcans are content with their lot and don't have the human desire to strive for betterment of their circumstances. 1. Something something something, Prime Directive. 2. Abandoning all superstition is definitely the right thing to do... unless you want technological progress apparently. And here we were thinking that science was the answer. Anthropologist Mary Warren dies of her injuries after a malfunction causes an explosion, but at least the timing of her death provided a valuable teaching moment. As he leaves Picard explains why he can't tell them more or give them tech and Nuria realises that everything that happened was a mistake. A small child of the village gives Picard a scarf, or belt or something. They now have the gift of knowing they have no limitations. * Except that as I have decided we all know, very early Vulcans were in fact elves from Middle-Earth who travelled to the West and got to pre-historic Vulcan. If you think about it you'll see it makes a lot of sense, as Vulcans are basically space-elves and that's probably why they retain the emotion of smugness. ** In early versions of scientific thought/methodology it was not unusual for natural philosophers (and their like) to be motivated by a desire to better understand creation in order to be closer to God. Not that I'm saying that's how all civilisations have or should work, it's just an interesting point in this context. Given the level of building skill they have, and that they have settled villages and enough time to have official record keepers. Not to mention the level of clothing and weaponry they clearly have to be post-agricultural. The scarf thing can occassionally be seen in Picard's quarters, basically being used as an anti-maccassar. And the 'ordered mind' thing because they're proto-vulcans is really wierd, Primitive Vulcans were an aggressive and warlike people. That's why Surak brings about his path to Logic and the suppression of Emotions because they're so strong in the Vulcan psyche.